When we make a quilt pattern, we typically end up with three different version of it; the cover quilt, the “alternate ending”, and the shop sample that can be used in a trunk show for local quilt shops. I wanted to show the shop sample for the Emilio quilt because it’s always interesting to see a pattern in yet another fabric range. The cover quilt for Emilio had very little difference in value; the alternate ending baby size was nothing but value contrast as done in gray scale. For shop samples, you want to use fabric that the shop actually carries, if at all possible. Our LQS carries the Pat Sloan line Sunday Drive from Moda, so we complemented that with a solid lime green for the background. 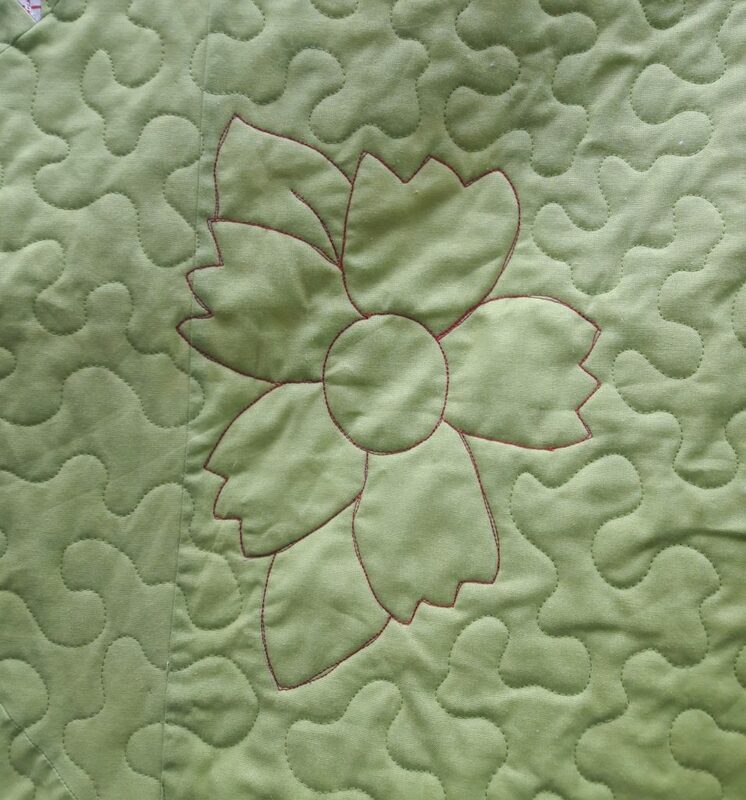 Of course, using a solid in this pattern for the background, compared to the original cover quilt with a print in that area, means you can focus on showing off a quilting design. One of the common themes in our “How would you quilt this?” segments is drawing quilting inspiration from the motifs of the fabrics themselves, and that’s exactly what I did here. I freehand sketched the flower shape with a water-soluble pen, and then went over it with two lines of stitching in a contrasting thread. 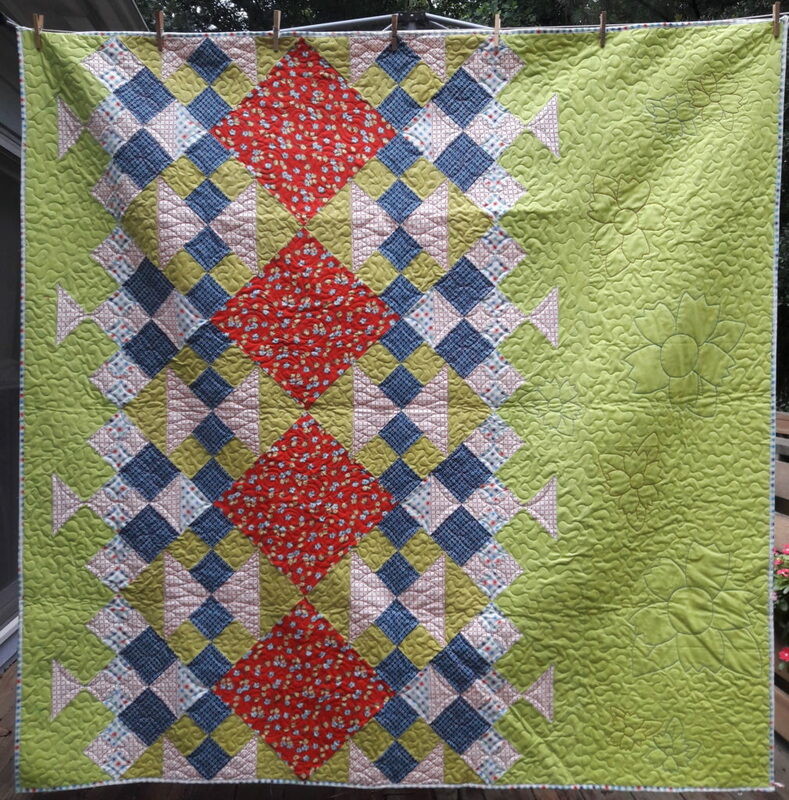 Check out the digital download of the Emilio quilt pattern yourself and get stitching! Super cute! I hope you aren’t offended but this is my favorite of the three quilts in this pattern.